Ocimum tenuiflorum, also known as Ocimum sanctum, holy basil, or tulasi or tulsi (also sometimes spelled thulasi), is an aromatic plant in the family Lamiaceae which is native to the Indian subcontinent and widespread as a cultivated plant throughout the Southeast Asian tropics. It is an erect, many-branched subshrub, 30–60 cm (12–24 in) tall with hairy stems and simple phyllotaxic green or purple leaves that are strongly scented. Tulasi is cultivated for religious and medicinal purposes, and for its essential oil. It is widely known across the Indian subcontinent as a medicinal plant and a herbal tea, commonly used in Ayurveda, and has an important role within the Vaishnava tradition of Hinduism, in which devotees perform worship involving holy basil plants or leaves. This plant is revered as an elixir of life. DNA barcodes of various biogeographical isolates of Tulsi from the Indian subcontinent are now available. In a large-scale phylogeographical study of this species conducted using chloroplast genome sequences, a group of researchers from Central University of Punjab, Bathinda, have found that this plant originates from North Central India. 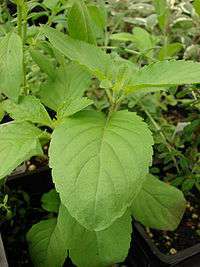 The discovery might suggest the evolution of Tulsi is related with the cultural migratory patterns in the Indian subcontinent. Tulsi leaves are an essential part in the worship of Vishnu and his avatars, including Krishna and Ram, and other male Vaishnava deities such as Hanuman, Balarama, Garuda and many others. Tulsi is a sacred plant for Hindus and is worshipped as the avatar of Lakshmi. It is believed that water mixed with the petals given to the dying raises their departing souls to heaven. Tulsi, which is Sanskrit for "the incomparable one", is most often regarded as a consort of Krishna in the form of Lakshmi. According to the Brahma Vaivarta Purana, tulsi is an expression of Sita. There are two types of tulsi worshipped in Hinduism: "Rama tulsi" has light green leaves and is larger in size; "Shyama tulsi" has dark green leaves and is important for the worship of Hanuman. Many Hindus have tulasi plants growing in front of or near their home, often in special pots. Traditionally, tulsi is planted in the centre of the central courtyard of Hindu houses. It is also frequently grown next to Hanuman temples, especially in Varanasi. According to Vaishnavas, it is believed in Puranas that during Samudra Manthana, when the gods win the ocean-churning against the asuras, Dhanvantari comes up from the ocean with Amrit in hand for the gods. Dhanvantari, the divine healer, sheds happy tears, and when the first drop falls in the Amrit, it forms tulasi. In the ceremony of Tulsi Vivaha, tulsi is ceremonially married to Krishna annually on the eleventh day of the waxing moon or twelfth of the month of Kartik in the lunar calendar. This day also marks the end of the four-month Chaturmas, which is considered inauspicious for weddings and other rituals, so the day inaugurates the annual marriage season in India. The ritual lighting of lamps each evening during Kartik includes the worship of the tulsi plant, which is held to be auspicious for the home. Vaishnavas especially follow the daily worship of tulsi during Kartik. In another legend, Tulsi was a pious woman who sought a boon to marry Vishnu. Lakshmi, Vishnu's consort, cursed her to become a plant in earth. However, Vishnu appeased her by giving her a boon that she would grace him when he appears in the form of Shaligrama in temples. Vaishnavas traditionally use Hindu prayer beads made from tulsi stems or roots, which are an important symbol of initiation. Tulsi rosaries are considered to be auspicious for the wearer, and believed to put them under the protection of Hanuman. They have such a strong association with Vaishnavas, that followers of Hanuman are known as "those who bear the tulsi round the neck". The leaves of holy basil, known as kaphrao in the Thai language (Thai: กะเพรา), are commonly used in Thai cuisine. Kaphrao should not be confused with horapha (Thai: โหระพา), which is normally known as Thai basil, or with Thai lemon basil (maenglak; Thai: แมงลัก). 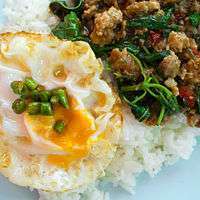 The best-known dish made with this herb is phat kaphrao (Thai: ผัดกะเพรา) — a stir-fry of Thai holy basil with meats, seafood or, as in khao phat kraphao, with rice. The genome of Tulsi plant has been sequenced and the draft genome has been published independently by research teams from CSIR-Central Institute of Medicinal and Aromatic Plants at Lucknow and National Centre for Biological Sciences at Bengaluru. The genome size was estimated to be 612 mega bases and results from the sequencing project show that certain metabolite-biosynthesis genes such as genes for biosynthesis of Anthocyanin in Krishna Tulsi variety, Ursolic acid and Eugenol in Rama Tulsi variety were expressed in large quantities. These metabolites were shown to have anti-cancerous properties as well. It was further commented that these metabolites could be utilized as anti-cancerous drugs. 1 2 Staples, George; Michael S. Kristiansen (1999). Ethnic Culinary Herbs. University of Hawaii Press. p. 73. ISBN 978-0-8248-2094-7. 1 2 Warrier, P K (1995). Indian Medicinal Plants. Orient Longman. p. 168. ISBN 0-86311-551-9. ↑ Kothari, S. K.; Bhattacharya, A. K.; Ramesh, S.; Garg, S. N.; Khanuja, S.P.S. (November–December 2005). "Volatile Constituents in Oil from Different Plant Parts of Methyl Eugenol-Rich Ocimum tenuiflorum L.f. (syn. O. sanctum L.) Grown in South India". Journal of Essential Oil Research. 17 (6): 656–658. doi:10.1080/10412905.2005.9699025. (subscription required (help)). ↑ Bast, Felix; Pooja Rani; Devendra Meena (2014). "Chloroplast DNA Phylogeography of Holy Basil (Ocimum tenuiflorum) in Indian Subcontinent". The Scientific World Journal. 70 (3): 277–85. doi:10.1155/2014/847482. PMID 847482. ↑ Lang, E. K.; Rani, Pooja; Meena, Devendra (Mar 1977). "Asymptomatic space-occupying lesions of the kidney: a programmed sequential approach and its impact on quality and cost of health care". South Med J. 70 (3): 277–85. doi:10.1155/2014/847482. PMID 847482. ↑ "Tulsi". Tamilnadu.com. 28 January 2013. ↑ Claus, Peter J.; Sarah Diamond; Margaret Ann Mills (2003). South Asian Folklore: An Encyclopedia. Taylor & Francis. p. 619. ISBN 978-0-415-93919-5. 1 2 Simoons, Frederick J. (1998). Plants of life, plants of death. Univ of Wisconsin Press. pp. 7–40. ISBN 978-0-299-15904-7. ↑ Chatterjee, Gautam (2001). Sacred Hindu Symbols. Abhinav Publications. p. 93. ISBN 978-81-7017-397-7. ↑ Flood, Gavin D. (2001). The Blackwell companion to Hinduism. Wiley-Blackwell. p. 331. ISBN 978-0-631-21535-6. ↑ Wilkins, W.J. (2003). Hindu Mythology. New Delhi: D.K. Printworld (P) Limited. p. 471. ISBN 81-246-0234-4. ↑ NIIR Board, National Institute of Industrial Research (India) (2004). Compendium of Medicinal Plants. 2004. National Institute of Industrial Research. p. 320. ISBN 978-81-86623-80-0. 1 2 Kuhn, Merrily; David Winston (2007). Winston & Kuhn's Herbal Therapy & Supplements: A Scientific and Traditional Approach. Lippincott Williams & Wilkins. p. 260. ISBN 978-1-58255-462-4. ↑ Puri, Harbans Singh (2002). Rasayana: Ayurvedic Herbs for Longevity and Rejuvenation. CRC Press. pp. 272–280. ISBN 978-0-415-28489-9. ↑ Punyaratabandhu, Leela (2014). Simple Thai Food. Ten Speed Press, Berkeley. p. 203. ISBN 978-1-60774-523-5. ↑ Biswas, N. P.; Biswas, A. K. (2005). "Evaluation of some leaf dusts as grain protectant against rice weevil Sitophilus oryzae (Linn.)". Environment and Ecology. 23 (3): 485–488. ↑ Padalia, Rajendra C.; Verma, Ram S. (2011). "Comparative volatile oil composition of four Ocimum species from northern India". Natural Product Research. 25 (6): 569–575. doi:10.1080/14786419.2010.482936. PMID 21409717. ↑ Golshahi H.; Ghasemi E.; Mehranzade E. (2011). "Antibacterial activity of Ocimum sanctum extract against E. coli, S. aureus and P. aeruginosa". Clinical Biochemistry. Conference: 12th Iranian Congress of Biochemistry, ICB and 4th International Congress of Biochemistry and Molecular Biology. 44 (13 SUPPL. 1): S352. ↑ Upadhyay, Atul K.; Chacko, Anita R.; Gandhimathi, A.; Ghosh, Pritha; Harini, K.; Joseph, Agnel P.; Joshi, Adwait G.; Karpe, Snehal D.; Kaushik, Swati; Kuravadi, Nagesh; Lingu, Chandana S; Mahita, J.; Malarini, Ramya; Malhotra, Sony; Malini, Manoharan; Mathew, Oommen K.; Mutt, Eshita; Naika, Mahantesha; Nitish, Sathyanarayanan; Pasha, Shaik Naseer; Raghavender, Upadhyayula S.; Rajamani, Anantharamanan; Shilpa, S; Shingate, Prashant N.; Singh, Heikham Russiachand; Sukhwal, Anshul; Sunitha, Margaret S.; Sumathi, Manojkumar; Ramaswamy, S.; Gowda, Malali; Sowdhamini, Ramanathan (28 August 2015). "Genome sequencing of herb Tulsi (Ocimum tenuiflorum) unravels key genes behind its strong medicinal properties". BMC Plant Biology. 15 (1): 212. doi:10.1186/s12870-015-0562-x. PMC 4552454 . PMID 26315624. Pattanayak, Priyabrata; Behera, Pritishova; Das, Debajyoti; Panda, Sangram (Jul 10, 2010). "Ocimum sanctum Linn. A reservoir plant for therapeutic applications: An overview". Pharmacognosy Reviews. 4 (7): 95–105. doi:10.4103/0973-7847.65323. PMC 3249909 . PMID 22228948.